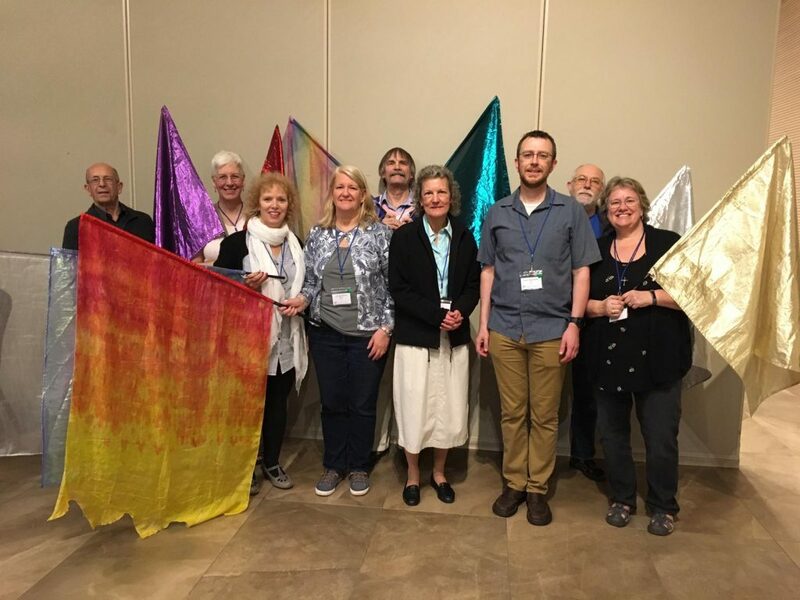 On March 9, 2019 a group of seven intercessors from Canada, USA and the United Kingdom arrived in Israel accompanied by Rev. Cindy Strickler and Rev. Martin Boardman for this Alignment Round Table event. Following the first Round Table event last May, Presbyterian Reformed Ministries International (PRMI), through Brad Long, had offered to provide event intercessors to model and mentor event intercession. Rev. Strickler and Rev. Boardman were the delegates to this year’s event and PRMI was also present “on-the-wall” providing event intercession. PRMI’s focus on prioritizing prayer means that in all we do, we seek to have on-site, and sometimes off-site, intercession. This active “on-the-wall” intercession is not seen as clearly in other ministries. Intercession is essential to creating a context where the Holy Spirit can work. At most Dunamis events there is a direction for teaching which help to frame the work of intercession. The specifics are subject to change by the Holy Spirit but the general direction is known. With the Alignment Round Table the general direction was not as clear to our intercessors, which meant there was huge need for being flexible. The conference began Monday evening, which allowed us to use Sunday and Monday for the team to get to know one another, pray for each other, as well as listen to the Lord for his strategies for intercession. This was a time of inner healing, unity and Holy Spirit empowerment for each team member. One intercessor had a vision of new gifts being received for each person as we prayed on the armour of God. We spent time praying into these new gifts. At the same time the Lord revealed strategies for the conference. This included praying for humility and grace for everyone as well as a warning to pray against the enemy’s plans to lift up words to cause offense and hinder God’s plans and purpose. It was an intense couple of days of intercession, but it paved the way for a united international team to stand on the wall during the event. The hotel where we stayed and where the conference was hosted overlooked the Judean hillside and a pathway which is the road to Emmaus. This is the same road mentioned in Luke 24, where Jesus met and talked with his disciples. As we met, we too encountered Yeshua, directing his international body. With 18 countries represented at the conference we were truly an international cross section of the global body of Christ. Alignment is not about the Christian Church becoming Jewish, but about recognizing that within God’s kingdom purposes there are different roles and different places. As we step into these roles there is a unity which develops that is powerful and will bring transformation. It was that alignment that we were praying for as a team. The conference organizer asked our team to lead morning intercessory prayer for the event. Morning prayer is a staple at a Dunamis event but was perhaps new for some of the people at the Round Table. It never ceases to amaze how the themes which the Lord highlights during morning prayer are picked up on during the day. For each of the three days we received a glimpse ahead of time about what God wanted to do. This meant that as intercessors and delegates we were ready for the Kairos moments which took place during our time together. It was as if God was pulling back the curtain in morning prayer to show us the places we needed to be ready to seek out Kairos moments during the day. When those times came the intercessors were ready to jump in and pray the moments would not be missed by the leadership. Again and again they stepped in and we watched the Lord move powerfully. As this group sought to walk out this alignment; seeing and acting as the one new humanity, it was quickly clear that this was not just Jew and Gentile working together but that the reality was far richer. Arab Christians, the Gentile church and Messianic Jews came together in unity, which moved beyond asking and extending forgiveness for past hurts and wounds. It went beyond the simple joy of reconciliation and fellowship together. It was developing into covenantal relationships of partnering in ministry together. Our intercessory team was a vivid picture of just this as Tikkun Global (conference organizers) and PRMI worked together to see the kingdom expand. This was a start. During one of the afternoon sessions, delegates gathered around tables (they were square) to pray and discuss ways to work together in the areas of prayer and intercession, media and communication, and world-wide evangelism. This was a powerful and effective time which produced some great starting points for future conversation and ministry opportunities. While the discussions happened in the afternoons, the morning sessions focused on worship with space for prophetic words to be shared. At times this led us into Kairos moments of engagement in intercession for aspects of kingdom advancement. During the first day, we engaged in intense prayer for the UK and the Brexit process, recognizing that this allows the UK to position itself more fully in God’s purposes for the nation of Israel. But at the same time, we acknowledged that this is a very complex situation. However, through the church, God has given a measure of authority to pray into the government and glory of nations. So, in faith we joined in agreement for God’s kingdom purposes to be pursued in this Brexit process and that the ground of the UK would be taken away from the enemy and used for God’s kingdom instead. On the second day, a prophetic picture of a bride dancing with Yeshua led us into a Kairos engagement. We prayed into the move of God needed within the nation of Israel to bring awakening to the Jewish people of Yeshua as Messiah. The Bride of Christ is not complete without these Jewish believers. The Messianic Jews are the first fruits of this larger harvest which is to come and which will be joined by the continued moves of the Spirit drawing Muslims and Arabs to faith in Yeshua. We moved into deep prayer with the Gentile church praying for Jews to come to Yeshua and the Jewish Messianic believers praying for Arabs to come to Yeshua. Together we prayed that the Bride would be made ready for her groom. On the third day, there was a significant prayer engagement centered around upcoming Israeli elections (April 8). Israeli politics are complex with governments formed through coalitions. The current coalitions have an Orthodox Jewish party in charge of the ministry of the interior, leading to increasing challenges and blockages to Messianic Jews receiving Aliyah (the right to immigrate and live as citizens of Israel in the land). In this complex mess of politics, political philosophy and coalition we recognized that this was a key time, a strategic time and a time for God’s kingdom pattern to be established and his will to be done. Continued strategic prayer into all three of these areas is needed. Blessing the community by providing intercession continues to strengthen friendships and relationships with Messianic believers in and out of the land. It is our hope to develop deeper relationships to mentor, not just model, event intercession and even provide needed practical teaching on inner healing and deliverance. Please join us in prayer for healthy fruit from this work and for fresh opportunities to work together in ministry.